Intel's Skylake-X platform promises to introduce the first ever 12-core SKU for the Mainstream/HEDT segment. Gigabyte’s upcoming X299 AORUS lineup has leaked out courtesy of Videocardz and shows the flagship motherboards in all their RGB glory. The X299 platform is Intel’s upcoming HEDT platform and will be codenamed Basin Falls. It is thought to be launch-ready for the Computex 2017 time frame (30th May 2017 to be precise) which happens in a few days. It is not surprising therefore that we are seeing leaks from various AIBs about their upcoming offerings as far as the X299 platform goes. Since this is clearly the high end market, AIBs have spared no expense in designing their feature-rich mobos. All of the motherboards below feature a 12 phase supply for the processor. The AORUS family of motherboards features an orange-black aesthetic and the entry level motherboard does not have any RGB features. You can see the glowing chipset as well as the sound board with its 5 phase supply, 5 PCIe slots (2 of which have LED lighting and probably x16) and the trademark 8 DIMM slots of the HEDT segment. There are 6 USB 3.0 Slots, a PS/2 port and the usual 7.1 Sound Output RCA ports. 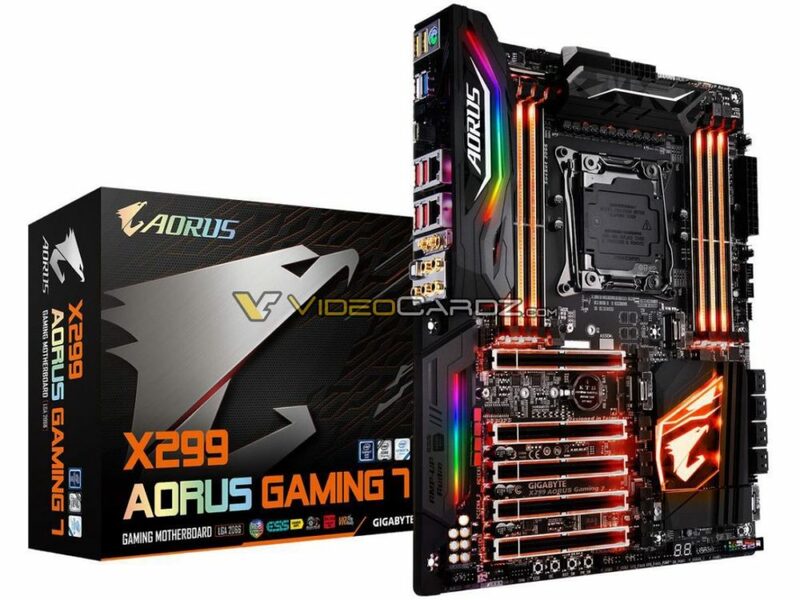 Coming up next is the Gaming 7 X299 motherboard from AORUS which showcases all 5 PCIe slots in orange LED lighting as well as the RAM slots (of which there are 8). The orange accents on the chipset heatsink are also, well, more accentuated. RGB also rears its head in this particular design and while I think RGB would kill the aesthetic over here, you can always set it up on a nice orange glow if you want to. The motherboard features, gold tipped RCA outputs, 2 ethernet slots, the usual USB 3.0 suspects as well as what appears to be thunderbolt / USB-C slots. The sound board has also been upgraded to a 7 phase supply. 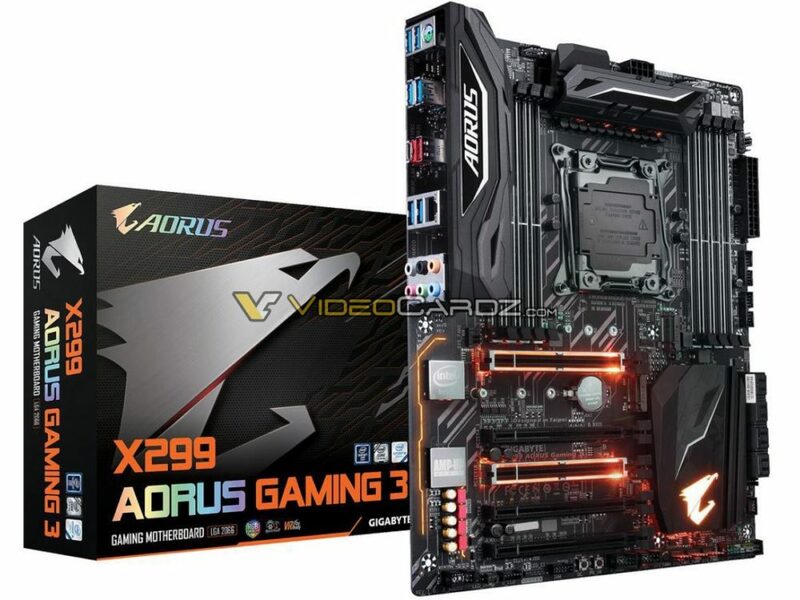 Finally we have the penultimate flagship of the lineup: the X299 AORUS GAMING 9 which features all of the above as well as orange LED accents on the I/O segment. This is an absolute beast of a motherboard and will probably be targeting the very high end of the high end market. There appear to be some I/O port changes but the picture is too blurry to make them out right now. Interestingly however, the phases for the sound board appear to have fallen back to 5 (unless we can’t see the rest of them in the picture, which I admit is likely). The mass availability date for the platform, is going to be on 26th of June 2017. Intel’s X299 platform will be shipping with not 4 but 5 SKUs. The five SKUs will include a 12 core, 10 core, 8 core, 6 core and 4 core model. 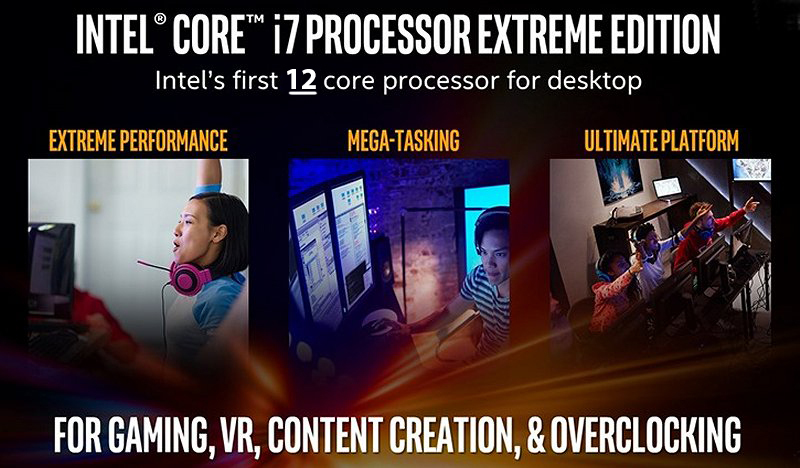 The 12, 10, 8 and 6 core models will be based on the Skylake architecture. The 4 core model will be based on the Kaby Lake architecture which launched on mainstream platforms earlier this month. All Skylake-X chips will feature a rated TDP of 140W (with the possible exception of the 12 core die) while the Kaby Lake-X chip will feature a TDP of 112W. All chips will be marketed as the Core i7-7000 series processors and utilize the LGA 2066 socket.